I'm pretty amazed when I scroll through this blog and see the pics of all the food I've eaten in Thailand. Quite frankly, I've eaten a lot of stuff. And just in case you're wondering, I do mean this in the boastful way that it sounds. But I also mean it in the literal sense: I eat a lot. 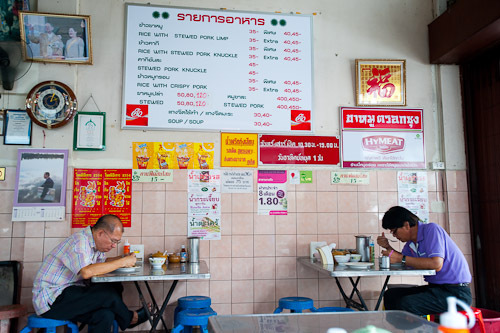 As illustrated above, my recent visit to Khao Khaa Muu Trok Sung, a longstanding restaurant off Th Charoen Krung, was an example of the latter. Despite my previous declaration, I haven't actually eaten much khao khaa muu, Chinese-style stewed pork leg, so I'm not the best judge of the dish. But I enjoyed the version sold here. The pork was fall-apart tender and well-seasoned. As is the case with this dish, it was accompanied by a vinegary dipping sauce studded with fresh chilies - a necessary divergence from all the fat and meat. I would have liked more of the crispy pickled veggies, but this was somewhat made up for by the tasty soup with bitter melon. 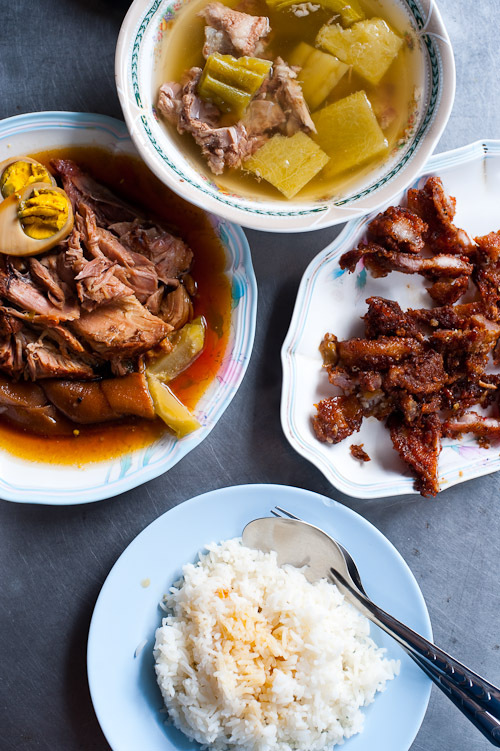 The only real weak point was the muu krob, crispy pork, which seemed to have been poorly seasoned and clumsily deep-fried several hours previous. which of course, I visited. Like I said, I've eaten a lot of stuff.